P!nk fans, we’ve got some exciting news for you. Due to huge demand from fans, she’s extending her sold-out Beautiful Trauma tour, in support of her most recent album, into 2019!! She’s headed to the Madison Square Garden on Wednesday 22nd May 2019! Whatever you do, don’t miss this – be quick and grab your tickets today!! P!nk is well-known for the incredible level of effort she puts into her live shows. Both the visual elements, from pyrotechnics and special effects, to the actual physical feats accomplished by the singer, including complex dance routines and high-wire tricks – all while singing! – are to be expected at her performances. But it seems that with Beautiful Trauma, she’s outdone herself once again. ”Each time you see P!nk you wonder what new elements she can bring to the performance, but each time she raises the bar yet again,” marvelled the National Rock Review. “Not only does she make the entire performance appear to be effortless, she truly looks like she is having the time of her life on the stage." What are you waiting for?? 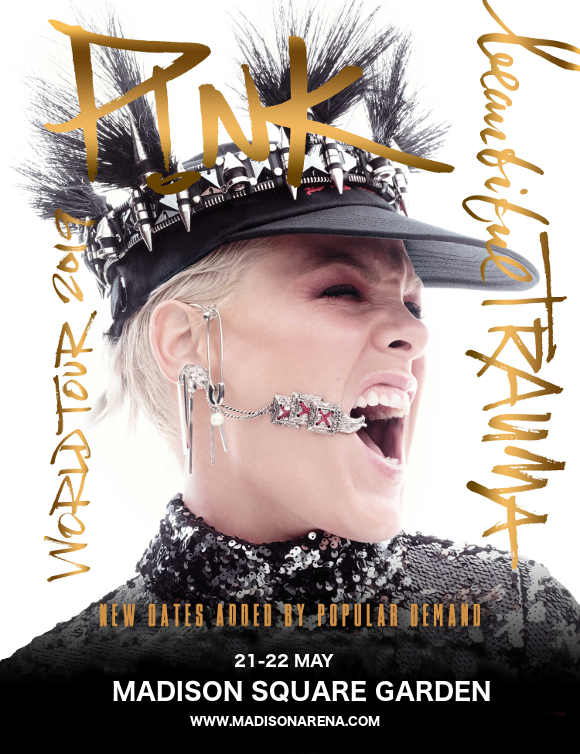 Grab your tickets NOW while you can and experience P!nk’s unbeatable live performance for yourself! !